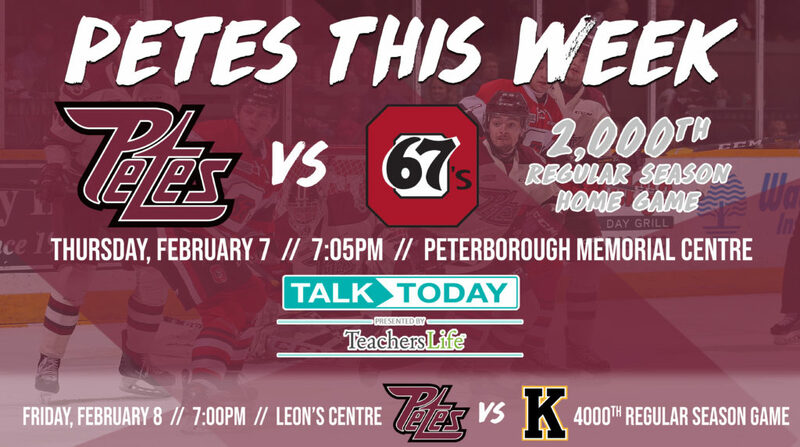 The Petes will play their 2,000th regular season home game on Thursday, February 7 at 7:05pm when they host the league-leading Ottawa 67’s at the Peterborough Memorial Centre. To celebrate the milestone, the Petes Education Fund will be offering a guaranteed jackpot of $2,000 and a special 50/50 ticket offer of 100 numbers for $20 (usually 60 numbers for $20) in honour of the 100 Petes alumni that have played over 100 NHL games. The Petes also hit another landmark this week by reaching 10,000 followers on Instagram. To thank them for their support, fans can buy one ticket for Thursday’s game against Ottawa and get a ticket of equal or lesser value for free. To take advantage of the deal, fans must show the celebratory photo on the Petes Instagram page at the PMC Baker Tilly Box Office. THANK YOU, PETES FANS! We’ve reached 10,000 followers! To say thanks, you can show this photo in person at the @ptbomemcentre Baker Tilly Box Office to buy one ticket and get one ticket FREE for tomorrow’s game against Ottawa! . . . Free ticket must be of equal or lesser value. As part of the Ontario Hockey League’s Talk Today program, presented by Teachers Life, the Petes have partnered with Canadian Mental Health Association Haliburton, Kawartha, Pine Ridge (CMHA HKPR) for Thursday’s mental health awareness game. CMHA HKPR will run a kiosk in the main lobby of the arena through the game to share information about mental health and their community-based services. Videos featuring Petes players and public address announcements about mental health will be integrated into the game. In a pre-game ceremony, the Petes Education Fund will present a cheque to CMHA HKPR and Team 55. The Kawartha Sexual Assault Centre will also have a kiosk in the main lobby to provide awareness surrounding their services and involvement with the OHL Onside program. A fundraising chuck-a-puck will support the Trent Forensic Science Society, while students of Westmount Public School will perform the national anthem. Fans can receive a Skip the Dishes coupon as they leave the game. The Petes will wrap up a short week on Friday, February 8 when they visit the Kingston Frontenacs, which marks the maroon and white’s 4,000th regular season game. Tickets for Thursday’s game are available through the Baker Tilly Box Office in person, over the phone at (705) 743-3561, and online.